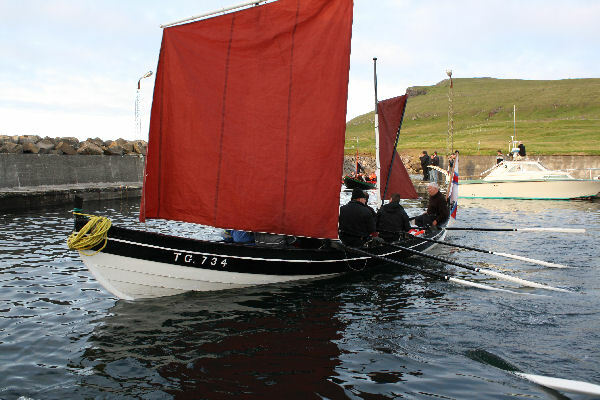 Hvalurin, The Whale (in english), is an eight-oar boat with a boathouse in Skálamøl, in the west part of Vágur. In 1930 the Dahl family, which at that time was a big business company in Vágur, with branches around the Faroes, built Hvalurin. The boat was built by Pól Hammer a local boat builder. Hvalurin was not just built to be used in pilot whale hunting, but also as a boat, which could be used in boatraces around the islands. This also means that Hvalurin has thinner boards than other boats. Hvalurin has with great succes been used in boatraces, and did also win the annual boatrace on St. Olaf’s Day, the national day of the Faroese people in 1930, the first year competing.